The French press coffee maker is, in every sense, the best option for the discerning coffee brewer, for one, it is a lot less pricey than the drip coffee makers we’re used to, and also produces very high-quality coffee brews. Coffee enthusiasts often opt for the French press over the drip coffee maker primarily due to the taste of the final brew, which is often affected by the filters in the latter option. By far the best offer you will get, this Bodum Brazil French press even surpasses some of the pricier ones in the list in terms of features. For one, it has one of the larger capacities in the list, which for less than $20 dollars, is really great. The compromise is on the aesthetic design of the French press, which can be considered a bit boring. Nevertheless, the brew quality is unquestionable so this is definitely one of the best deals you can get. The Bodum Brazil 1.5L French press looks solid all the way despite relying on a tough, temperature-safe borosilicate glass beaker to maintain the temperature of the brew and also to prevent breakage. The good news is that its 3-filter stainless-steel screen is enough to make brews of the highest quality, so you won’t need to purchase another filter. Other things to mention about the French press include its exclusive safety lid, its pure brewing process and its dishwasher-safe components. Capable of making very strong brews. The triple filter French press easily ranks just as high as options that are almost twice its price. You will neither have to compromise on the capacity nor get any extra filter screens outside of the purchase. The best part is that the French press looks every bit as professional as its pricier counterparts. For under $20 dollars, this is without a doubt the best bargain on the list. Sleekly adorned with a polished chrome outline which holds together the clear borosilicate glass, it is definitely one of the better-looking presses in this range. Appearances aside, the 34-ounce capacity is more than enough for a regular java lover (it is enough to produce 8 coffee cups at once).On to its more unique features, a lot of consideration has been put into the design of the plunger and as a result, it is one of the most comfortable to use around here. It’s not a very big deal but if you’re going to make coffee brewing your morning routine for a while, you might want to turn your sights to something a little easier to operate. For the average-sized household, 8 finely brewed cups of coffee would be considered sufficient for a day’s work, which is why this 34oz Bodum Chambord French press is the best option for you. At just under $30, you can get professional-grade brews from the comfort of your home with relative ease and consistency. Furthermore, the pot is easy to clean as it is dishwasher safe and comes with a very efficient 3-part stainless steel mesh. This Bodum Chambord French Press makes up for its basic capacity with a stunning exterior finish. The carafe features the usual borosilicate glass and chrome exterior that, with a nice polish, can really bring out its elegant side. It retains the classic appearance of the original French press as much as possible to make operations seamless. A 3-part stainless steel mesh gives you exactly the kind of finish you want by infusing the natural oils and tasteful flavors of the grounds within the beverage. Professional brewers shouldn’t cut corners, especially if they are looking to make great quality brews in large quantities. As such, the 51oz Bodum Chambord French press stands out in its ability to seamlessly merge the two desirable traits to offer something that will cater to the needs of a moderately fast-paced establishment. 12 cups of highly refined coffee at a go and a very elegant design is what the professional brewer stands to benefit from this French press. There’s not much to be said about this particular French press in terms of uniqueness. The only highlight is it’s significantly larger capacity and its simplistic, somewhat elegant appearance. Its sleek chrome finishing is also worth mentioning. 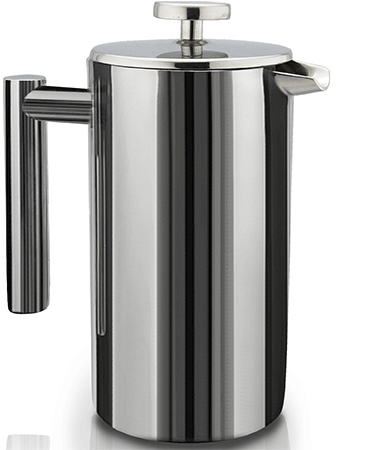 The Linkyo French press takes on a more futuristic appearance with its polished stainless steel exterior. Save for a glass strip on the side that gives you a view into the inside of the coffee maker, it is entirely made out of high-quality stainless steel. Borosilicate glass lines the inside of the coffee maker, improving its ability to survive falls and other accidents. The coffee maker comes with a free reusable coffee filter, which is also made out of stainless steel, and two extra screens for the filter. The 2-year guarantee backing this offer suggests that the French press is highly unlikely to disappoint. Comes with a total of 4 filters; 2 installed and 2 spares. Completely made out of stainless steel and glass with no plastic components. Safe to clean using the dishwasher. 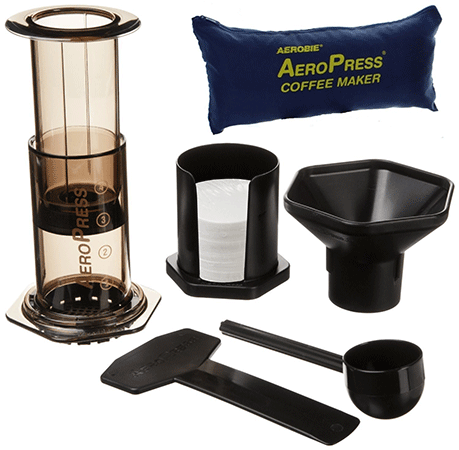 The Aerobie distances itself from the usual run-of-the-mill French press coffee makers with its unique design. It can be used to make the regular coffee brew or the more potent espresso brew with relative ease. Its micro-filtering capabilities ensure that the coffee can be put in storage for a few days and still be perfect for use. Every purchase comes with a complementary tote bag that will make shipping it around very easy. 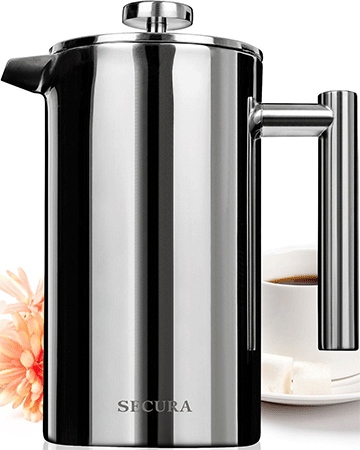 This French press from Secura looks every bit like a professional-grade coffee maker, not only from its lavish design but also from what it says it can do on paper. For one, it has 3 layers of stainless steel filters to keep the coffee brew as pure as can be. What’s more, you can stack up two or more filters in order to get the level of refinement you prefer. Shatterproof borosilicate glass might be tough, but the stainless steel construction of this French press practically guarantees you years of use if maintained well. Cleaning it is a cinch since the filter screen can easily be disassembled. The Sterling Pro looks as professional as it sounds with its premium stainless steel design and mirror finish that makes it quite a kitchen appliance to own. It is however somehow lacking in the filter department as it uses a double layer of filter screens. Nevertheless, these get the job done. 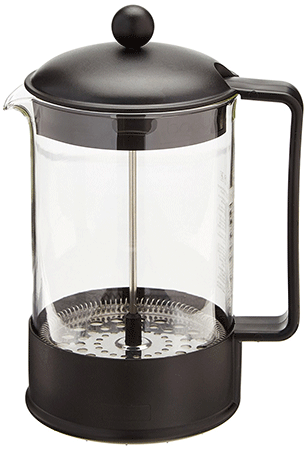 The French press maintains the brew temperature using its double-walled construction. With a 34oz capacity, it is worth every cent noted on its price tag. Nice, solid stainless steel build. Very efficient double screen filter removes all grounds completely. The chrome version of the Sterling Pro looks to be more superior to its stainless steel counterpart in a number of ways. It doesn’t look as flashy, admittedly, but the sleek chrome accents certainly do give it a pricey appearance despite its mild price tag. 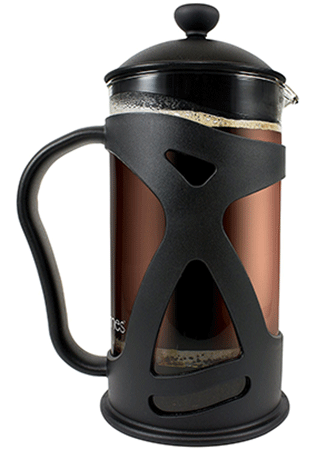 The 34oz French press delivers when it comes to brewing and is capable of brewing incredibly refined cups of java. Every purchase comes with two extra replacement screens, which is quite a friendly deal considering the price of the French press. Easily disassembled for cleaning up. Can survive more than a few hard knocks. Can be used for cold brews. The sheer appearance of the KONA French press is the definition of deluxe. Outside of the tough borosilicate glass, the brewer features a protective layer that, as opposed to just being wrapped all around it, has been stylishly infused to create a look of perfection. Aesthetics aside, the 34oz capacity is nothing to complain about, the brew quality is as good as you can ever hope for, and for good measure, the French press is significantly easier to handle and very dishwasher safe. Can also be used to brew loose leaf tea. Cheaper than most French presses in its range. Filter screens will determine the quality of the final brew, especially when it comes to making the more refined java brew, espresso. A triple-layer steel filter screen may be considered the best you can do since it has the ability to eliminate even the finest grounds. Filters that can be dismantled for easier cleaning should also be considered before the rest. Dual-layer filters are also not too shabby and can produce more than sufficient results if used correctly. Capacity is mostly important if you’re looking for something to make large quantities of the brew over a short period of time (in which case, you should simply opt for an espresso machine or the more traditional drip coffee maker). A 1L (34oz) capacity should be enough for the average household, office or establishment. However, for a commercial eatery, you should consider going for the larger sized French press coffee makers. Aesthetic design is sort of important if you’re running a reputable establishment and want to retain some level of class for interior décor purposes. Chrome finishes are by far the most visually appealing, not to mention durable. However, you should also consider the durability of the French press, specifically its ability to survive a nasty fall or repeated knocks over a long period of time. Borosilicate glass is obviously a necessity if you want to retain brew temperature at an optimum all through the process. No one should squeeze their budget too much when it comes to French press coffee makers since they’re all relatively inexpensive. Splurging on a few more premium features is in fact recommended as you are more likely to enjoy your refined java brews for longer. All in all, the difference in brews largely depends on the preferences of the drinker and, admittedly, their brewing proficiency. What matters is that you have a French press that simply does exactly what it is supposed to do.